Last month ancestry.com announced that it had added to its collection of London records, including new material from the London Metropolitan Archives. This included poor law records for London. Browsing these, I noticed that the surname Crespigny came up eleven times in the London, England, Workhouse Admission and Discharge Records, 1659-1930. All were for an infant called Richard Henry Crespigny (1891-1894). I had never heard of this child before and thought I would investigate. I ordered his birth and death certificates. Richard Henry Crespigny was born 1 November 1891 at 3 Smith Street, South Chelsea, the son of Richard Crespigny and Matilda Crespigny née Garland. His father’s occupation was given as commercial traveller. The informant was his mother, registering the birth on 11 December 1891 in the district of Chelsea, sub district of South Chelsea. She she gave her address as 3 Smith Street South Chelsea. Richard Crespigny junior died of diphtheria on 25 May 1894 a the South Western Hospital Stockwell. He was two years old. Under occupation it was stated he was of the Chelsea Infirmary, Cale Street S.W. , an institution associated with the Chelsea Workhouse. The Chelsea infirmary was built in 1872, north of the workhouse. 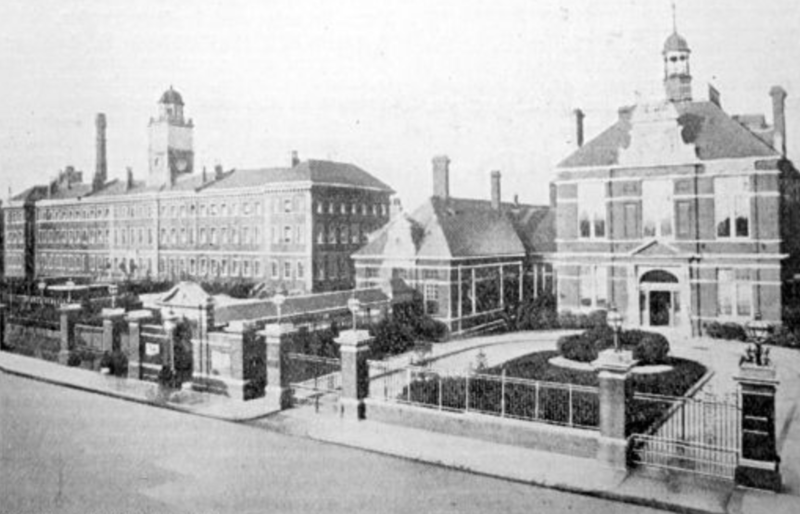 The London City Council took over the workhouse in 1930. The buildings have since been demolished. Richard Henry Crespigny, six months old, was first admitted to the Fulham Road workhouse on 23 May 1892 from the Parish of St Margaret. The name of his relative or friend was Ruth Glazebrook and her address was Corner House Henfield Shermanbury, a village in Sussex forty miles south of London. On 7 November 1892 Richard Henry Crespigny was readmitted to the workhouse from the infirmary. On 3 December 1892 he was discharged to hospital. On 28 January 1893 he was readmitted to the Fulham Road workhouse from the hospital. On 1 June 1893 he was again discharged from the workhouse to the infirmary. He was readmitted to the Fulham Road Workhouse on 30 November 1893. His admission record note that he was deserted. On 3 March 1894 Richard Crespigny was discharged from Fulham Road Workhouse to Chelsea (Britten Street). The next day, 4 March, he was discharged from the Britten Street Workhouse to the infirmary. He returned to the workhouse from the infirmary on 22 March. On 25 April he was again discharged to the infirmary. He died a month later. I have been unable to find any record of his parents Richard Crespigny or Matilda Crespigny née Garland in the 1891 census, marriage or death records, or any other online databases. I have no knowledge of anyone with the Champion de Crespigny surname having the first name Richard who was born in the nineteenth century and a potential father of this child. I looked at the census record for 3 Smith Street for 1891. The census was held on 5 April 1891. On the 1891 census George Toplas is recorded as living at 3 Smith Street with his wife, five children and 6 boarders, none of them Richard or Matilda. It may be that Richard Crespigny and his wife became boarders there five months later. 3 Smith Street is just off the Kings Road and not far from the Chelsea Workhouse. Ruth Glazebrook appears on the 1891 census living at the Corner House cottage Shermanbury. She was 33, single, living with her widowed mother and two small boys described as boarders: Henry Pitchard age 4 and Henry Bathe age 2. Her occupation is given as baby farmer. Baby farming was the practice of placing infants with foster women for a fee. It came to an end after the passing of legislation in the UK parliament in 1897 and 1908 which regulated the change of custody of children and defined the improper care of infants. It appears that Richard Henry Crespigny was placed in the care of a baby farmer, abandoned by his parents, and once the money that paid for his care had been used up, he was placed in a workhouse. He appears to have been ill a number of times before succumbing to diphtheria.